On Monday, I started the 2008-09 school year. What I didn't expect was what waited for me at school. Our vice principal is a big fan of garage sales, and he told me on the first day that the next day he was bringing me a special Mac artifact that he had picked up over the summer for $1. I wondered what it could be. A Newton? An old Performa? He refused to tell me what it was until the next day, when he presented me with one of the best gifts I have ever gotten: an almost mint condition copy of the first ever issue of Macworld. I carefully read through the entire issue and found that it was no longer just a magazine, it was a time machine looking back on the birth of the Macintosh, which will have its 25th anniversary in January 2009. 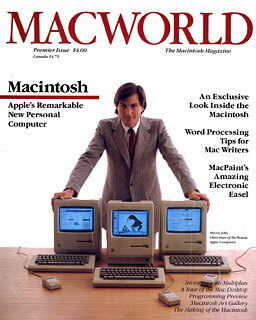 Most of the magazine was devoted to the release of the brand new Macintosh personal computer. There were snippets on the new products that were made for the Macintosh and many short articles about the Mac development process by people who made the Mac a reality. There were also detailed looks at the interior of the Mac from the logic board to the CRT. One thing that struck me was the mass of changes from the original Mac OS to Leopard. 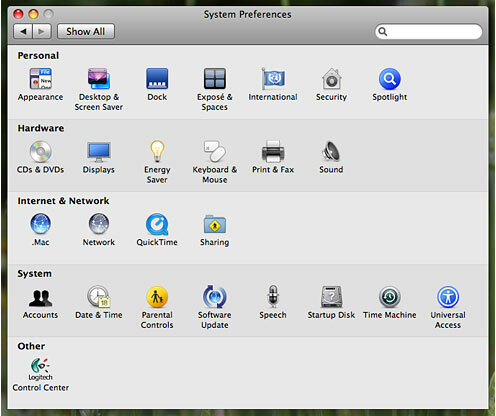 Whereas the original Mac had nine control panels in one small window, Leopard's System Preferences morphs into any one of dozens of multifaceted control panels, from Bluetooth to Parental Controls. While the first Mac had just a few bundled programs, like MacWrite and MacPaint, today's Mac comes with apps for everything from video chat to calendar management. Another obvious development is in hardware: In 1984, $2,495 would buy a 9" black and white screen and an 8 MHz processor. Today, less than half that will buy 20" of color and effectively two 2.4 GHz processors. Not only that, but the computer itself has shrunk to take up less space (relative to its screen size, and beige plastic is a thing of the past for Apple. One facet of Apple's total evolution is the change in product offerings over the years. Apple used to make things like printers and floppy drives; now they only offer essential accessories, like displays, port adapters, and modems. Although there are many Mac fans who treat Microsoft as Apple's nemesis, some have forgotten that they were responsible for helping the Mac gain such a great standing with their excellent productivity software. In fact, one of the features of this premier issue was an interview with Bill Gates, now considered by some to be Enemy #1. Believe it or not, before Windows came along to compete with the Mac, Bill Gates was quite complimentary of the pint-sized Apple powerhouse. He stated, "...the Mac has easily twice that [power] of the PC." He even said the Mac was, "...fun and exciting...." At the end of the interview, Gates agreed with the prediction that, "The Mac will be remembered as one of the great classic machines." I must admit, I don't hate Microsoft. I only hate what has happened to the company in terms of quality and innovation. Ever since Windows took off, it seems like every revision of both it and other Microsoft software has gotten buggier and less original. A lot of Microsoft's new software ideas have simply been lifted from other innovative companies in the industry, such as Apple. Interestingly, Microsoft has long recognized the Apple community's love of new technologies and cutting-edge ideas. In fact, many new ideas were first tested on the Mac market through Microsoft's Mac Business Unit, because the failure of a product there wouldn't hurt Microsoft as badly as a mistake in a Windows software package. One thing I think is interesting is the fact that the magazine chose the name Macworld. Apple's previous computers were the Lisa and the Apple I through III. In spite of that, Macworld saw that the industry-altering innovation of the Mac would resonate for many years to come. In fact it has lasted almost 25 years.